Today is the winter solstice. What do you do on this day in your contries? In Japan, there are two practices. 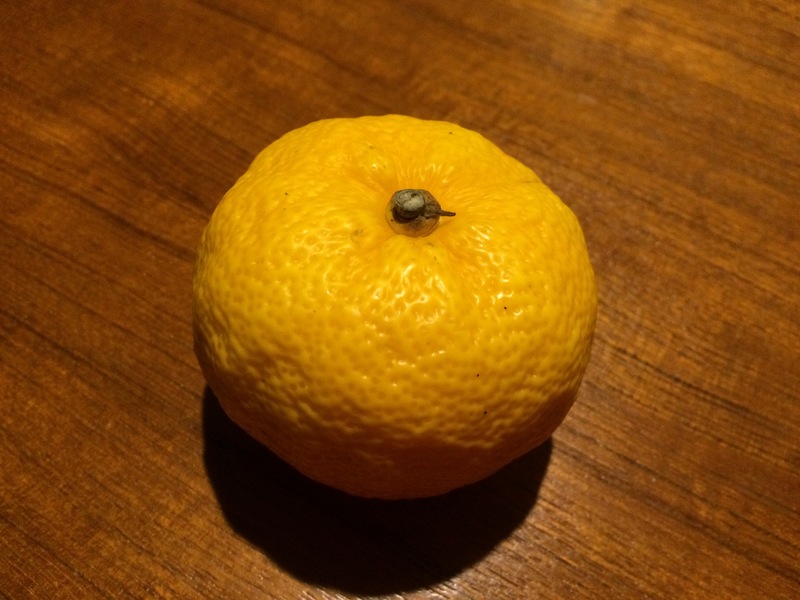 One is to take a “yuzu-bath” – putting several yuzu fruits in a bath, which is said to prevent cold and flu. Another practice is to eat food which names include the sound of “n” to bring “un (luck)” – namely, nankin (kabocha = pumpkin), undon (udon= noodle), renkon (lotus root), ninjin (carrot), kinkan (Kumquat), ginnan (ginkgo nut ) and kanten (agar). Among them, the representative one is pumpkin. It is said that, in the old days when it wasn’t so easy to secure food in winter, they kept pumpkins they grew in summer and start eating them on this day. 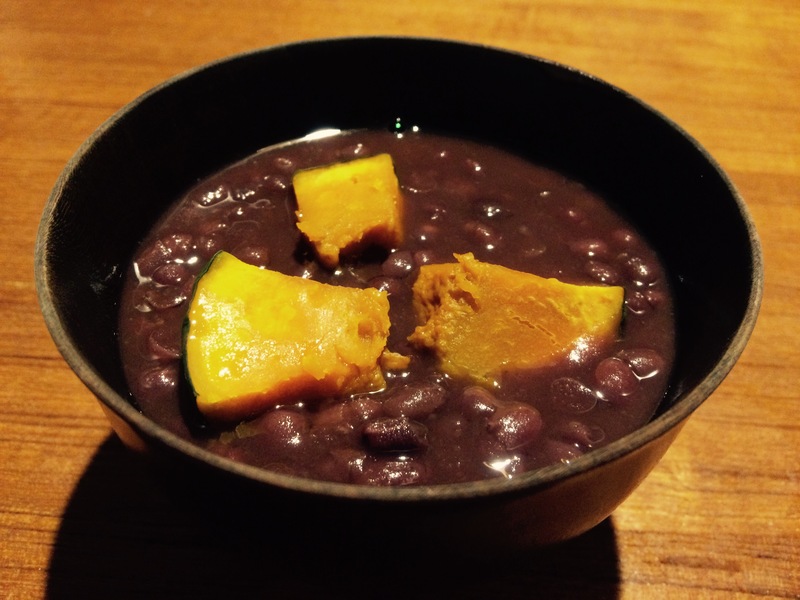 So today, I made kabocha–zenzai (sweet bean soup recipe with pumpkin). Here’s how to. 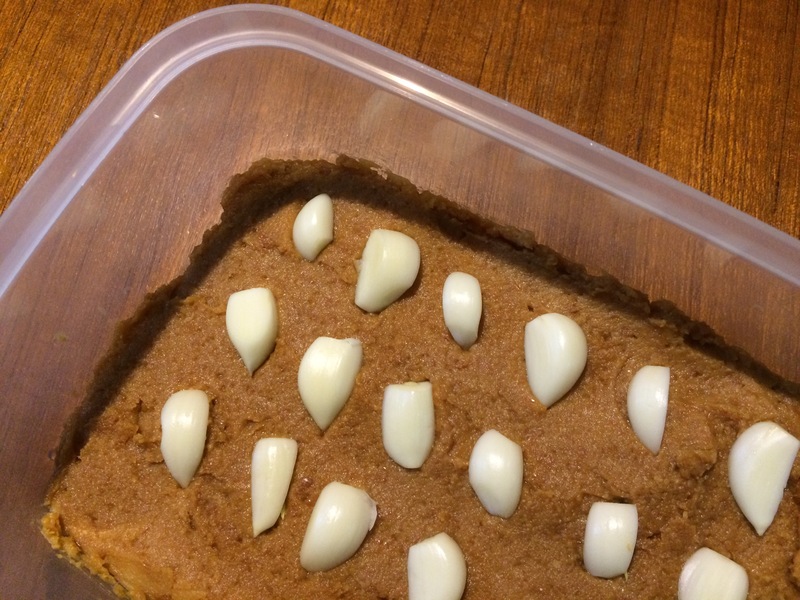 Ingredients: pumpkin, red beans, sugar (60% of red beans: please adjust the amount as you like. I prefer less sweetened beans but usually red beans:sugar =1:1.) , a pinch of salt. Make anko (sweet bean paste). Wash beans, add them and cold water in a pod. Once it’s boiled, throw away hot water. Add cold water (4 times the amount of the weight of beans) in the pod again. Simmer for an hour. When the beans become soft enough, flavor with sugar and add a pinch of salt. *If it becomes too thick while cooking, add extra water. Cut the pumpkin into bite-sizes. Microwave (or steam) them till soft. As many cuisines do, Japanese cuisine has various ways of pickling and marinating to preserve food: nuka-zuke (pickling vegetables in rice-bran paste), asa-zuke (pickling vegetables lightly with salt and other seasonings), kasu-zuke (pickling vegetables or fish in sakekasu) , to name a few. 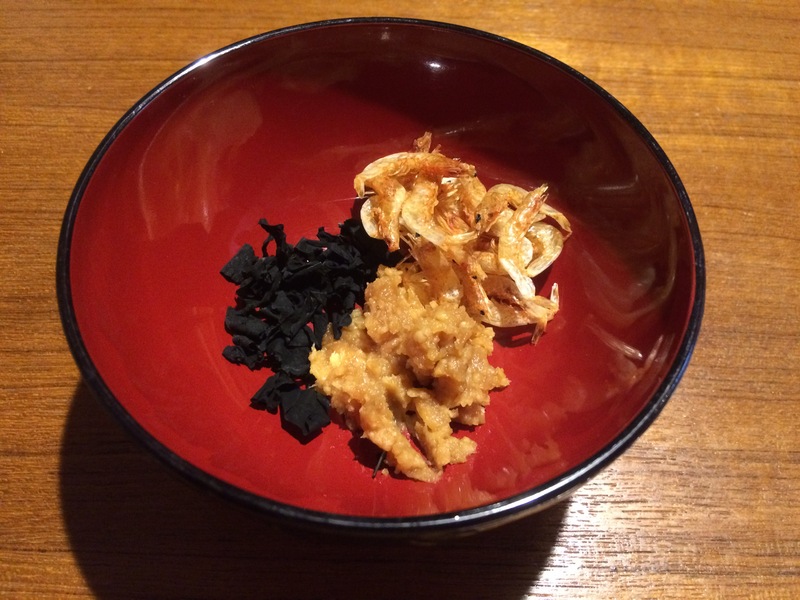 In many parts of Japan, every household used to have one nuka-doko (rice bran paste to make pickles). Now the number of household with their own nuka-doko has decreased, but it’s gaining attention again among those who love natural food. Although I want to have my own nuka-doko, to be honest, I don’t really like its taste. So instead, I started to make my own miso-doko (miso paste to marinate vegetables, meat and fish). I love miso and it’s far easier than nuka-doko to maintain. Following a famous recipe of Matsuda Michiko, I finally made a ninniku-miso-doko (miso paste with garlics). According to her, it can last for long time thanks to the antibacterial effect of garlics. 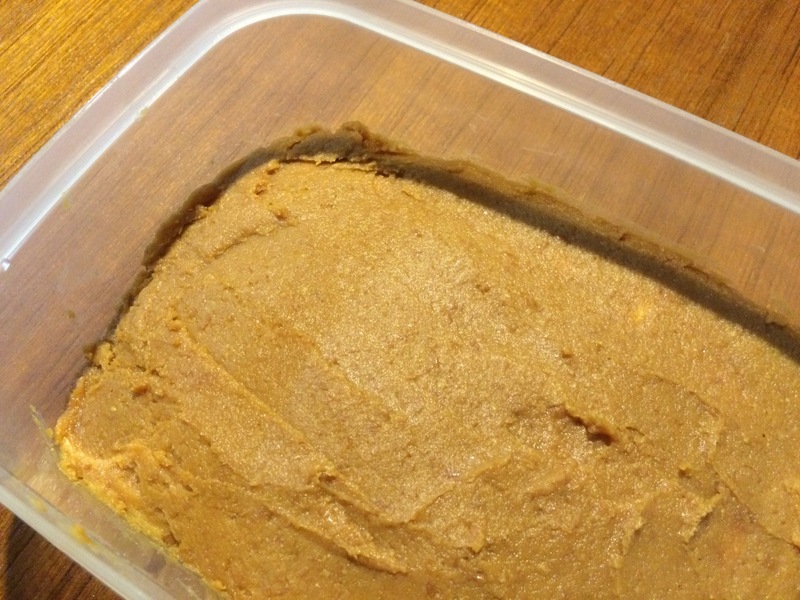 First, as per the recipe, I mixed 500g miso paste (I blended two different kinds of miso), approx. 67g sake and 1 head of garlic (peeled and sliced) and left in a fridge for 10 days. Ten days later, marinated quickly boiled beef overnight. According to the recipe, marinating beef will better the taste of miso paste (Personally, I think this step can be skipped, because the miso paste with garlics, before marinating beef, already tasted great)… It’s all about preparation! After that, any ingredients can be pickled. *Her book says even raw ingredients can be marinated in the same container, I prefer separating small amount of paste on plastic wrap to marinate such items. So far, I’ve tried pork, carrots and the two ingredients as below. I didn’t know miso-marinated sashimi tasted so great! 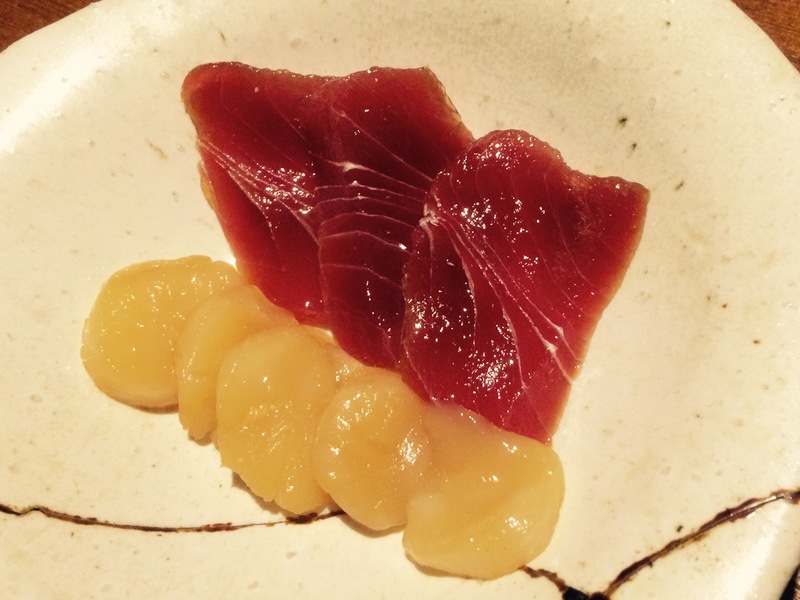 If you like raw fish, it’s worth trying. Just marinate sliced sashimi as you like (I used tuna and scallops) for about 3 hours. Wash off the paste before serving. They go very well with sake! It’s quite a famous recipe. Drain water off tofu and marinate it in miso paste for a couple of days. Wash off the paste and slice it before serving. 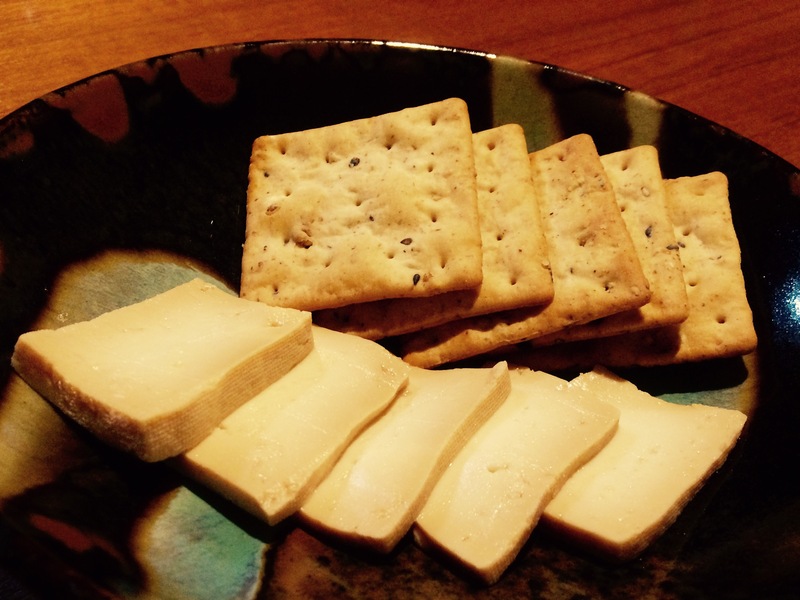 It tastes somewhat like cheese and will make a good appetizer. 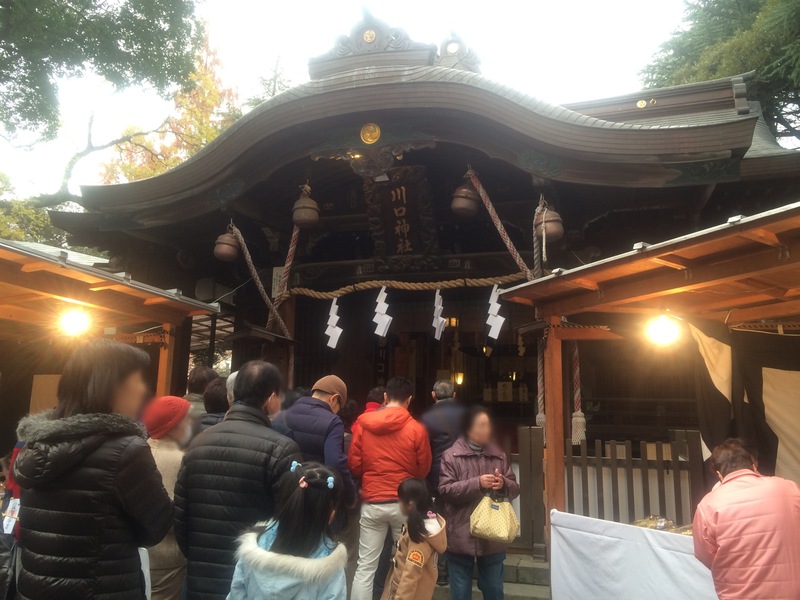 Tori-no-ichi, which literally means “fair of rooster”, is an annual event held at particular shrines (Otori-jinja shrines are famous) mainly in and around Tokyo, to express appreciation to the deity for the past year and to welcome the new year. In Tokyo, it’s usually held on the days of rooster on zodiac calendar in November, but in the suberbs, there are lots of tori-no-Ichi in December. 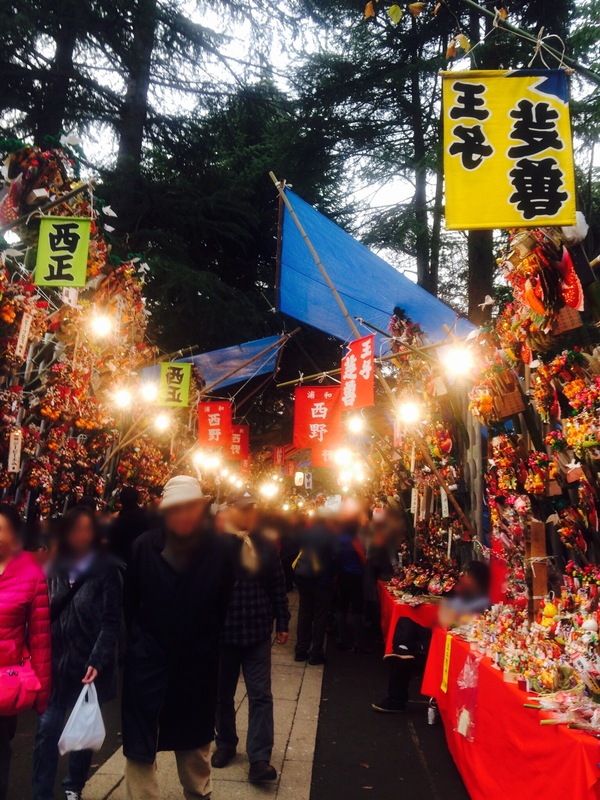 In the precincts, rake-shaped charms called “kakkome” are sold. Decorative ones are popular among business owners as they are believed to invite good luck. They are often decorated in small restautrants, bars and shops. 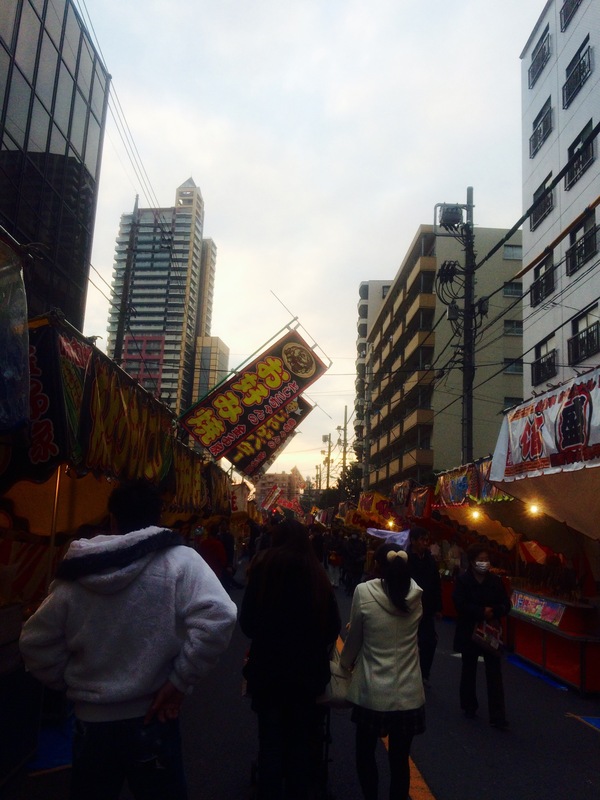 After visiting shrines, it’s fun to look around the stalls selling candy and snacks. For those who love bonsai and Japanese traditional cultures, I found an interesting event to share with you – Japan International BONSAI Symposium 2016. It’s free of charge, and will be held on February 11, 2016. What I found the most intriguing is that there will be a Kyogen act, which is a traditional comic and mime play. Simultaneous interpretation service will be provided. Find more details on their website. In response to The Daily Post’s weekly photo challenge: “Eye Spy“. 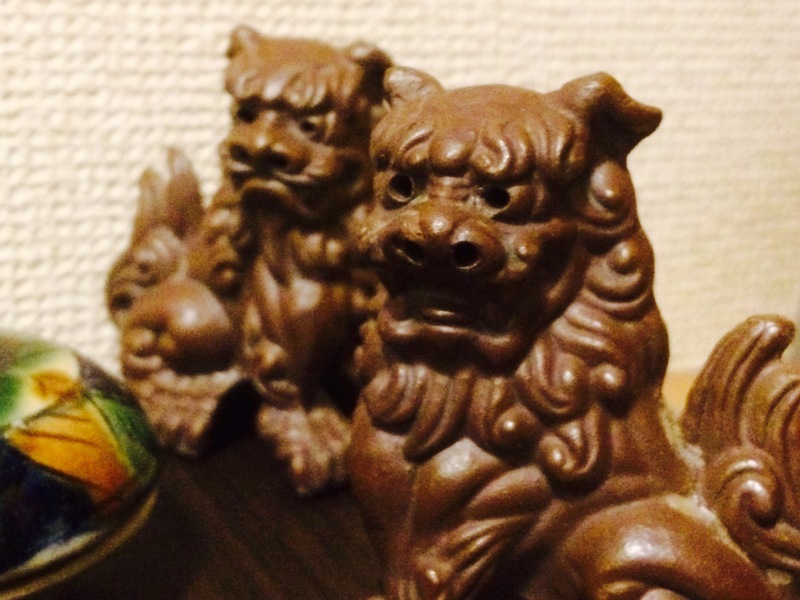 These are small Shisa ornaments (guardian lions of Okinawa) decorated at the genkan (entry space where you take off your shoes) of our place. My husband got them a long time ago, when he visited Okinawa on the school trip and has been treasured them since then! If you go to Okinawa, you can see lots of them on the roofs or at the gates of buildings. It is said that Shisa have the power to expel evil spirits and protect us. Looking at their sharp eyes, I sometimes feel like that they keep an eye on us to see if we are doing the right thing. They help me clear away bad ideas from the inside and straight myself.